It was the first really warm evening of the year and with a date or 06-06-06 maybe some Members had thought of other things to do. However those who attended were made welcome & given a voting form by Carl, G3PEM. John, G8DET started the evening off by explaining that his current computer was purchased in 1998 and runs Windows 98. He wishes to replace it to go on BT Broad Band Talk, run 2 monitors and PhotoShop CS2 for Web construction. 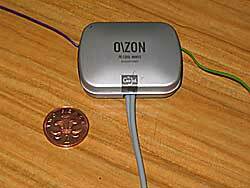 He also wants to run weather satellite downloads using a serial port. He hopes his new system will last at least 5 years with Windows XP Pro. His specification had taken at least 3 months to prepare and was being built by a computer company in Southampton. 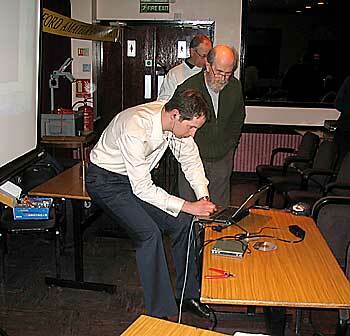 Carl, G3PEM next showed O/H slides of his "Recycled 17 Metre Aerial". He said that although there was a case for multi-band aerials he felt it was more efficient to make an aerial just for the band you wished to work. He had chosen to build a Vertical for Omni-Directional working, this he described using overhead slides. Using various computer programs he had designed and built a Vertical with a plastic base plate and a collar incorporating 4 radials. The Aerial could be collapsed for portable working. It was tuned with a small choke and a 300pF capacitor. He used 10 to 35 Watts rather than Kwatts to work a number of distant stations around the World with reports of typically 5 by 5. Apart from the Aluminium tubing which he had been given, Carl used only parts he had to hand. These parts included plastic milk bottles, old car brake springs and some Meccano pieces. He did not need to buy anything. He had taken down the aerial now that leaves had appeared on a nearby tree - to be erected next winter. Patrick, M0XAP also produced a series of Aerial related projects. He started with a 1 1/2 metre long Earth Spike made from solid copper, which conveniently mounted a flattened copper water pipe to house a PL259 connector. All photographs by Colin. G0TRM. 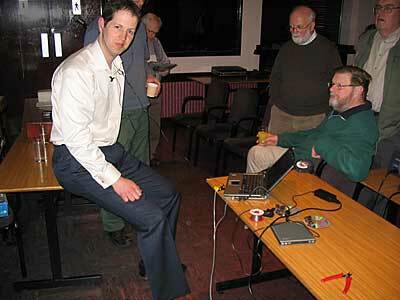 He then told the audience about his G5RV aerial for 40, 20 & 10 metres where the tuner was in his Transmitter. His G5RV was supported at one end by an assembly that could double as a 9 Metre high Vertical. It comprised a scaffold pole and a lightweight aluminium top section. A wooden stake mounted in a 'Met Post' was used to support the assembly and to act as an insulator. The Earth spike also supported a lightning arrestor and a remotely operable change over switch, which was used to short together the ends of the G5RV down lead, turning it into a 'TEE'. This switch had been in his garden for 3 years without water getting in. 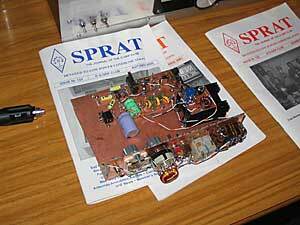 Motivated by the May presentation by Hans Summers G0UPL, Geoff, G7KLV said he just had to read SPRAT (the magazine of the QRP Club) and found inspiration. He had always wanted to have an Inductance Bridge & found one he could make. 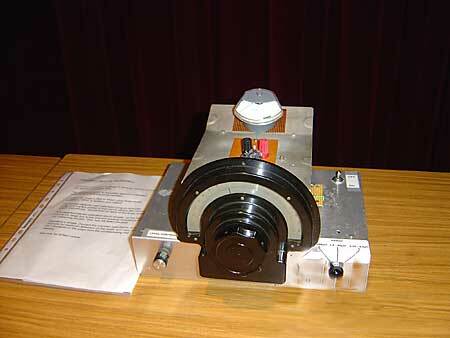 It used 3 oscillators and a variable capacitor to read off the value of the coil under test. Geoff used an old R1132 VHF Receiver dial which really looked the part and gave a large-scale read-out. The bridge measures from 1/4 to 450 micro-Henries. 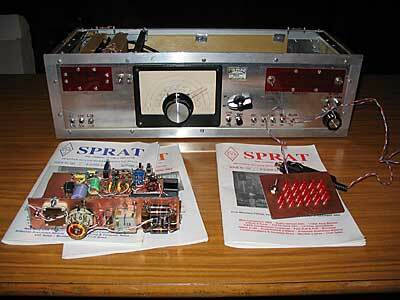 While looking through SPRAT he also came across a Capacitance Bridge which captured his imagination so he built it. It would NOT work no matter how he checked the circuit - in the end he decided it could NEVER work as published. He modified the operating frequency and now has a working meter. 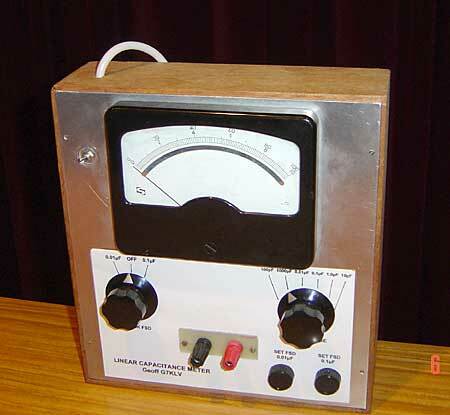 It uses an AC Voltage across the Test Capacitor which is to be measured and the value read-off on a meter. 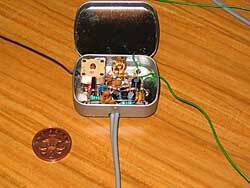 It can measure 15pF to 10 microfarads. This unit was nicely marked using Word and entailed printing out successive copies until the lettering agreed with the required panel - this took more time than the construction of the unit. Both units were built in less than 3 weeks with little time for much else (much to the annoyance of the XYL). Anthony, M1FDE said he wanted a Triplexer for 6, 2 & 70cm. Since he could not find one he decided he would design one. Using the Internet he found Diplexers so stitched a few designs together. He tested the values out on a computer but had to vary values to fit into readily available components, eg a 22.3pF is not made. The computer simulation produced results of 0.2dB in the Passband and about 30dB down outside. Effectively he had put together a Low Pass, Band Pass & High Pass Filters. Since he does not run more than 30 Watts he feels his components should stand the test of time. Anthony then produced a Crossed Yagi for 2 Metres he had been given. Trouble was he did not have a matching harness for it so built one out of the RSGB VHF Manual. This consisted of a box, switch and a number of very accurately cut coaxial cables. When the Aerial is connected with 2 identical lengths of coax cable to the Switching box the following combinations can be produced. Circular, left & Right hand phase, 0, 45, 90 & 135 degrees. Colin, G0TRM is a serious collector of Morse Keys. While eating his dinner the one day wondered whether a Knife & Fork could be used to make one! Bending the fork prongs up to make two side terminals & using the knife blade as the centre spring, with a gentle bit of soldering - bingo - he had one and demonstrated it to the surprise of the audience. Pity he has nothing to eat with now! The meeting stopped for a refreshment break and to allow Carl to count the votes. During the break an aerial was spotted at the back of the room and the owner was asked to describe it, but regrettably not until after the prizes had been awarded. 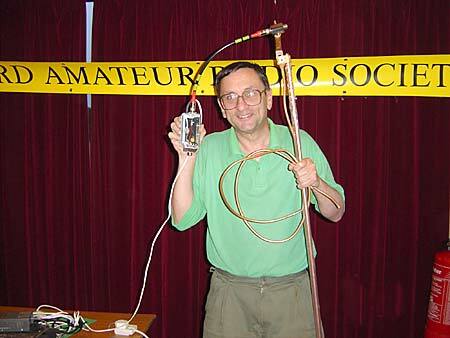 John G4CCL had constructed an antenna for 70 cms. He explained that he found another use for 4 pieces surplus plastic, which came another source. He used them to support the Quad Dipole & Reflector on his Aerial. He had used Brass rod from B&Q as it has less skin effect than stainless steel. The dimensions were taken from American published papers where they have an Aerial Feast (competition & meeting). The aerial was nicely made. Thanks to everyone who took part & to Carl for organising the voting. 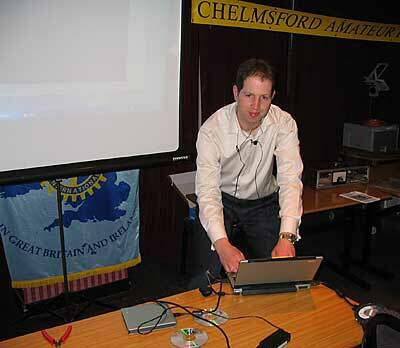 Hans had travelled from Surrey to Cambridge to Chelmsford to present his Web based talk on QRP. 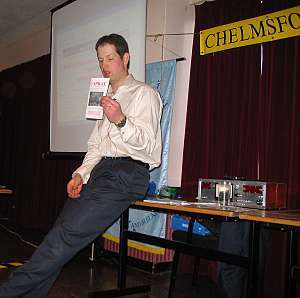 He reminded us that QRP was 5 Watts CW or 10 Watts SSB and then gave a plug for the QRP Club and their excellent magazine, SPRAT, ( £6 a year and worth every penny for the Mag. Alone ). He has been licensed since 1994 and although being a Physics Graduate, had no formal electronic tuition. He wanted to show us his enthusiasm for radio and homebrew in particular. Years ago he made up his mind that he would not be a "black box man" and would pursue the hobby with only his own built kit. This he has managed to do. 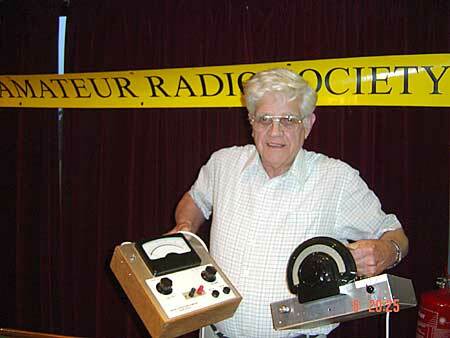 Hans said his first introduction to radio was when he was six, when for his birthday his Father bought him a crystal radio set kit, and with his help he made it up and was able to receive Medium wave signals. This started him off on a hobby of dismantling old radios and electrical gear for parts to construct his many projects, which were scavenged from rubbish dumps, jumble sales and gifted from friends. When he was eleven and with help from his Father he built a short wave regenerative receiver which he showed us on the screen mentioning a Jackson Bros. variable capacitor and dial on the front panel. He then related a story about him getting an E-Mail from a man in South Korea asking where he could obtain one. Hans searched the Net and made other enquiries to find Jackson's were now part of the Mainline group. When he phoned them they sent him a catalogue, he told them they ought to have a web site and he somehow got talked into setting up one for them. Refusing payment and other perks they offered but accepted their offer of their junk box. This was delivered to his work address and turned out to be a 4x4x4 ft crate causing some embarrassment to the facilities manage being delivered by a lorry with a crane and weighing several tons. Although he has now left this employer (on good terms - not because of this) much of it is still in their basement being gradually smuggled home past the XYL (junk and XYLs don't usually mix well!). After leaving University in 1994, getting a job and a Wife he did not do any radio for 8 years apart from reading Radcom every month and being fascinated by Pat Hawker's Tech Topics articles. Eventually he felt he must build something and incorporate the techniques he had learned the receiver he had with him featured Huff Puff stabilisation and Polyphase Phasing methods for direct conversion. 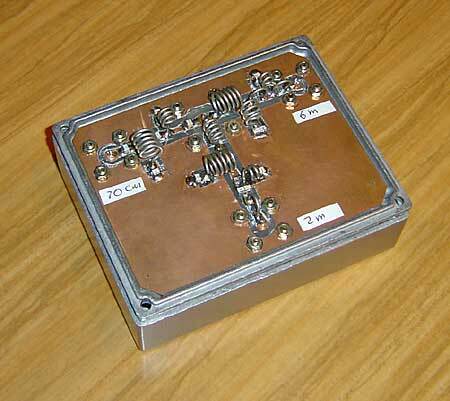 Utilising his junk box supply of valves he built a one valve transmitter to a design by a Swedish Amateur, SM5GNN and had his first QSO with a station 12 miles away. During which he discovering that his homebrew ATU (which he had made at University and never tested) was labelled wrongly and resulted in the aerial being tuned for max reflected power and minimum transmitted power. It worked much better after that and 10 watts to 30 ft of wire in the attic produced many German, Swedish and other station on the 80 meter band despite being crystal controlled. Hans then told us about taking crystal cases apart and using a felt tip pen to load the crystal and lower its frequency in his case from 3.579 to 3.558MHz.and making a new case from PCB. Hans then gave us an intensive run down on his developments of circuits for Huff and Puff and oscillator stabilisation using digital counter techniques as used in his direct conversion receiver and minimise projects. After the break Hans set up a demonstration of his small receiver made only last week to receive the QSS slow morse using Fourier Analysis and computer display. He was confident that signals from across the world would be displayed and he and we were not disapointed. Photo from the screen of the very slow scan Morse number "0", possibly from New Zealand being sent on a sked for our presentation. 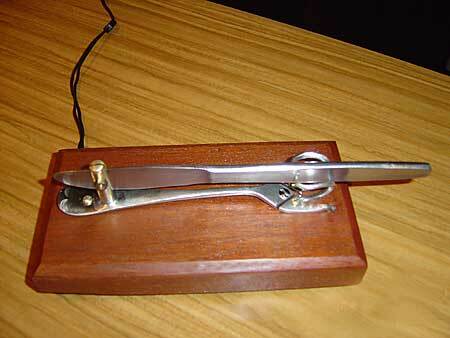 He then told us of his single chip transceiver from a SPRAT article that he took to America on a business trip and operated from his hotel room using a micro-switch as a key and a battery pack of D cells rolled up in the New York Times and held together with Selotape. His current project that he showed us was a Pixie Sprat design for 20 metres which he intended to produce in a box with self contained key, phones battery, and a space for aerial wire. He concluded with a story of a redundant computer CRT monitor left on his desk after a flat screen one was provided. After many requests to remove it he threatened to take it to pieces, still no action, so he built a tranceiver to high standard using only bits salvaged from the monitor. Many ingenious adaptions had to be made including using the bottoms of electrolytic capacitors for knobs to operate the trimmer type potentiometers scattered about inside monitors these days. Hans, thank you for an excellent presentation most enthusiastically put over. I have heard it said from one listener the best he had heard at the club meetings. Write-up by Tony Gilbey, G4YTG. Robin flew into Heathrow at 6.25am BST to give CARS this talk. We think this is the furthest anyone has travelled so far!. Robin Butcher was supported on more "technical topics" by Doug Zeeman. After an introduction giving details of the Institution we saw a film about the Lifeboat service and this was followed by questions. Robin said it maybe ten years old but it provided an awesome reminder of the power of the sea in stormy conditions and a fine tribute to the men and women who set out to selflessly save lives at sea. We learnt about the different classes of lifeboat, updated by Robin afterwards with details of the more modern and staggeringly expensive lifeboats. To see these large boats put through their paces was impressive and we saw some of their development and testing procedures including the capsize test where the boat is literally turned upside down and must roll back upright. Of interest to us was to see the Atlantic 75s capable of 34 knots which are based along the Essex coast. There are seven stations on our coast, the 75s now being upgraded to Atlantic 88s capable of 40 knots. As we saw this was not in just calm conditions but setting out when only the foolhardy or very brave and dedicated lifeboat men would set out. It says much of the training and dedication that there is no shortage of such people. We were told that the old idea of local fishermen setting out on the sound of the maroon is dated. Crews now come from all walks of life answering the pager at any time setting out in all weathers as volunteers. Only one in ten may have previous sea experience. The lifeboat college in Poole set up in 1974, with a full bridge simulator however makes up for this. That this is dangerous work was amply demonstrated through details of the Penlee disaster and the loss of the Longhope boat in 1969 and eight crew members. As is often the case families are involved together crewing the boats and in this case more than one generation was lost. Such is the pride and dedication that we learnt later that a Grandson was now a lifeboat man. The modern lifeboat is a sophisticated piece of kit. 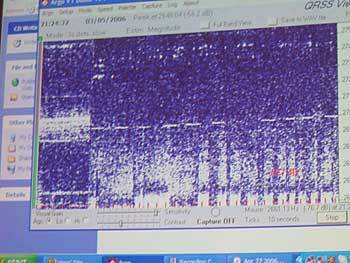 Closely liaising with the coast guard and the search and rescue helicopters the communications by radio on dedicated frequencies using noise cancelling microphones is impressive indeed. Add to that the modern use of GPS with a direct down link between the helicopter and the boat and the two perform almost as a single unit. The statistics provided by Robin are staggering. 350 boats, 230 stations, 4,500 volunteers, 350 of whom are women. In 2005 there was an increase of eight percent on launches to 8,273! It means in the summer there are repeated launches throughout the day. But the institution is moving on. There are four dedicated units on the Thames, we were told not always so thanked after rescuing potential suicides, and an increased use of beach rescue teams for swimmers in trouble or people trapped by a rising tide. Morecombe and Southend have to cope with the extensive tidal flats so the use of hovercraft is the norm. There is a rapid response team, set up as a result of floods. They went to provide expert assistance in the floods in Mozambique. The Institution we were shown has kept up with the times and modern systems, but the driving force would still be recognised by the founder who in 1824 set out to "save life at sea". This is still a voluntary funded organisation. Robin was very clear that it should remain so, free from government funding. Almost unique and very different than for instance the U.S.Coast Guard who have different additional defensive roll to play. The CARS Members thoroughly enjoyed the presentation and we were all awed by the dedicated personnel. Money raised by the raffle and Roy's book on Danbury and the lifeboat institution sold that evening, was donated to the Institution. We all hope never to have to go on a Lifeboat in an emergency, but as Robin pointed out there is a collection of boats at the RNLI museum at Chatham Dockyard, funded by the national lottery. If you have not been I for one can also thoroughly recommend it. Write-up above by Jeremy Barley, M0DUT. They have to have very good Communication equipment to be able to talk to helicopters, Police etc so Doug talked a little about this aspect. Sir William Hilary, a past owner of Danbury Palace, near Chelmsford went to the Isle of Man in 1818 and campaigned for the introduction of Lifeboats. He personally rowed in many rescues and in 1822 he and a crew in 2 boats saved 97 lives from the Royal Navy Cutter "Viglant". In 1826 he gave a Lifeboat to the 4 principal harbours of the Island. So started the first sea rescue service, so we have a local claim to fame. In recognition of Sir William starting the "Royal National Institution for the Preservation of Life from Shipwreck" (as it was called then) he was presented with a Gold Medal, now given in recognition for bravely. He was Awarded a second Gold Medal for rowing, (at the age of 59) in a rescue boat to save all of the lives from Steam Packet vessel "St George" in 1830 during which he broke 6 ribs. There is a monument to him on Douglas Promenade and another was unveiled by Prince Michael of Kent in September 1999 on Douglas Head overlooking the Bay. 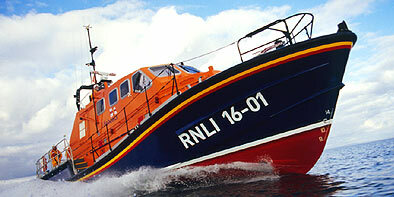 Since being founded in 1924, the RNLI has saved over 137,000 lives. Thanks to Roy Pledger of Danbury for the information quoted above from his book "For those in peril on the Sea". Another very good presentation which generated a lot of interesting questions. Thank you Tony & Doug. Last revised:- 15th August - Minor amendments & 23rd June to add the June Meeting Report.